While they're delicious on their own or in desserts, apricots are also terrific in savory recipes. While they're delicious on their own or in desserts, apricots are also terrific in savory recipes. From super-fast sandwiches to incredible dumplings, here are seven ways to use apricots in savory dishes. 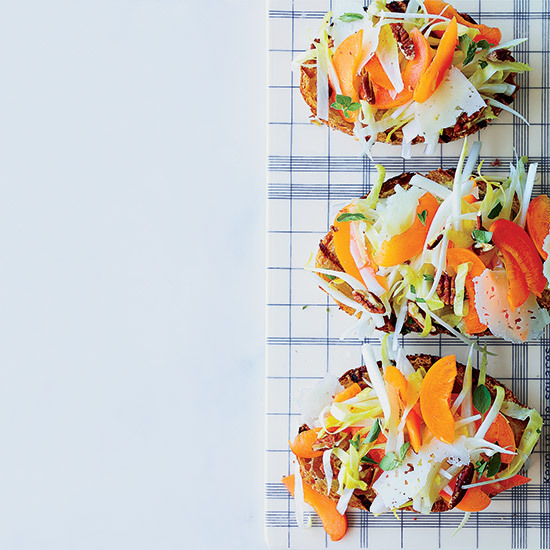 These fast, open-face sandwiches combine crisp endive, apricots, toasted pecans and sharp Manchego cheese. Ready in just 30 minutes, this hearty breakfast is made with red quinoa and almond milk. An apricot-based sauce brushed on chicken wings before grilling gives them plenty of flavor. Chef Suvir Saran's version of the classic Indian dish is made with fluffy rice and layers of yogurt, pistachios and apricots. These delicious kebabs are a popular South African dish. F&W's Kay Chun brushes roast chicken with a buttery apricot-thyme glaze during the last 20 minutes of roasting. These healthy and not-too-sweet dumplings make a great end to a meal.